I wore this to eat dinner at the Eiffel Tower. It was magical (and, since someone asked about food- it was delicious food. I think I had sea bass this night, with foie gais as an entree and cheese as the meal's finish.). But, since as I' mentioned before, the blog did not come on the honeymoon with us, I had to wear this dress a second time for you all to see. Twist my arm, why don't you? This confection was my Shopping in Paris moment (Did anyone get Anastasia flashbacks for a moment? Love that movie). Now, as far as I'd observed, Parisians mostly wore neutrals. Blacks, browns, whites. And were casual, but very trendy, for the most part. So cue my confusion as most stores we'd pass were selling brightly colored clothing. And we'd arrived in the middle of the city's soldes- sales. Not small discounts either. Think Black Friday, but for weeks, and you'd get these sales. But who was buying these things? And where were they wearing them? Ah, well, I'd tell myself, you don't really like any of these clothes either. And who wants a chainstore item when you are in the fashion capital of the world? Why get something you can get anywhere then? So, on a rare sunny day, we made our way out towards the northern edge of the city to the famed Les Puces de Saint-Ouen Market- supposedly the largest flea market in the world (It can be hard to get to; thankfully blog Oh Happy Days has the best instructions on how to get there). Unbelievable. I cannot stress this enough. UN-believable! The prices were not fantastic, but it was endless and filled with treasures. I'm used to thinking something 50 years old, is old. Here, entire sections were set aside for things from the 1800s, Art Deco, etc. Sadly, we did not get any photos of the place, but rest assured. It is unbelievable. Google knows. We wandered, strolling among Napoleon II era chairs, golden, lion-headed door knobs, old photographs, 1930s Chanel jewelry, birdcages looking like palaces and the like when from above a bright something caught my eye. Clothes! Above were several clothing stores, and buried in the stacks of clothing was this beauty. The tag dated is 1955-1960. It has a gorgeous full skirt of a New Look inspired dress and was handmade. My husband bought it for me. Not black, not casual nor chic but it makes me beautiful inside and out. that hat looks familiar...?LOVE the dress! That dress is stunning, and the story is even better! Loving the hat with it, too. Magical! you look absolutely gorgeous in this dress Kristian! I esp love the close up of you in the second pic down. and how amazing that you find this vintage gem at a Parisian flea market! and super cool a blogger had instructions on how to get there!! they have those same sort of sales in Spain and I def did hit up the chain stores more than I'd like to admit because 10 euro Zara dresses seemed too good to pass up. then the airline lost my suitcase w/ most my new things though and refused to reimburse me for it because they didnt tag the bag and it was a Spanish airline and have no sense of customer service but i've gotten terribly off topic. you are gorgeous! Kristian- i don't have a reply thing on my blog (or know why I can never see your replies on here for that matter... maybe a lack of blogspot) but yes, I've been gluten free for almost three years and have not looked back once! i never buy gluten-free things at stores (just eat naturally gluten-free things) because they're usually just crap food but the gf scones were a super fun treat for once. I was sugar free, including any sweeteners (splenda, etc. ), honey, fruit sweetener for probably 8 months. It was definitely great for my body but ah, I love chocolate and ice cream too much so now I just try to work on moderation. So interesting to know. Since getting diabetes, I've found it really interesting to talk to people who have made diet choices like that. I've been eating more gluten-free things, since they are usually lower in carbs. You look absolutely stunning! I love this dress-- what a cool find! I've never been to that flea market, but it's definitely on my to-visit list. And dinner in the Eiffel Tower? How terribly romantic! It was romantic! And yes, you need to visit this place. Such a fun treasure hunt! Oh, Kristian! You and this dress are both gorgeous! Wow, what a find. It's SO pretty, and so very "Kristian!" What a wonderful piece to remember your honeymoon from. Those Parisian ladies in black and neutrals don't know what they're missing out on. Very me? I think so too! It is wonderful to find things like that vintage/thrift shopping. They have great thrift stores thee but up till this I hadn't seen anything that either A) fit or B) was my style. But it is still so fun to look. The dark and neutrals though did look very chic and, well, they have such tiny closets in their apartments, they need things that go together because there isn't room for much! Wow! That must have been a magical experience. <3 This is THE perfect dress. I'm positive you turned heads with this one. The colorful and bright prints are so commanding. Thanks for letting us see this dress! Oh Thank you so much Anna! What an amazing dress! You look so beautiful. And what a great story! That flea market sounds aboslutely amazing. haha "google knows". ugh i could get happily lost there for DAYS. and things from the 1800s? now that's magic. and KRISTIAN! this outfit! that dress is a total beauty, but i cannot get over that hat. i now need something like that, and immediately. it still boggles my mind how uncolorful french people are, but i think that outfit just yells "paris"! DAYS and DAYS, right? I so wish there had been a convient way to buy and ship furniture. The hat is adorable right? I'm very spoiled; a good friend let me have it when she was moving. Oh my what a story and what a dress! I love it! You will cherish it and the memories forever I'm sure. For all the times I've been to Paris I've never gone to the marche au puces. Next time I go I really need to change that. Oh you definitely should go Suzanne! What/where is your favorite place to go in Paris? 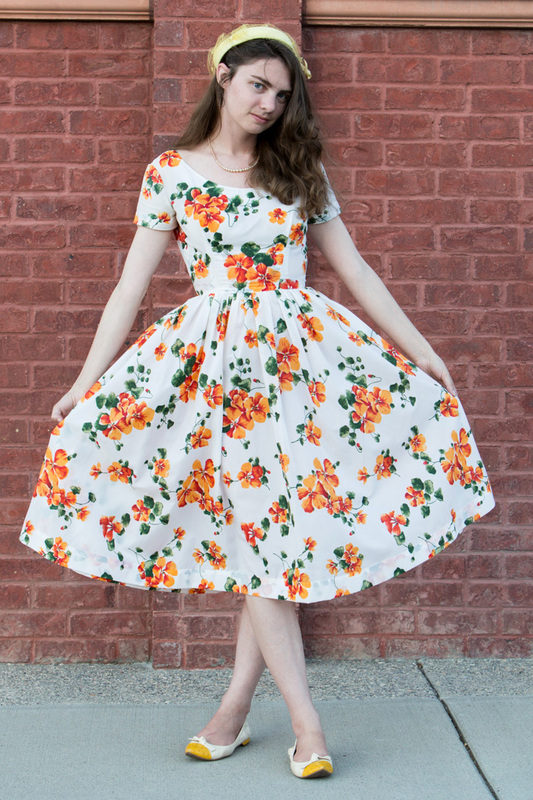 This dress is gorgeous and you look so lovely :) I love the orange flower pattern. That flea market sounds amazing too. Did you enjoy eating at the Tower? We're going to Paris in Dec. and I'm trying to create a list of must-do things! It was a lot of fun, but I'm not sure I'd recommend it. We got the experience as a wedding gift; normally it is quite, quite expensive as far as we could tell. Plus, for the meal you only go up tot he first platform. Most go up at least to the second so you might get more out of merely taking the elevators up. Our favorite restaurant was Chez Chaliters. It was the best food we ate and the cheapest dinner. It doesn't do reservations, but has great atmosphere and we didn't need to wait long. The best tip we got was to look at purchasing a Museum Pass. It counts a a ticket for most museums and tourist sites in the city and allows you to often pass lines. Might not be a big of a deal to bypass crowds in December but was amazing for us. That dress is so beautiful! And hurray for Anastasia fans :) I've now made it a life goal to go to the flea market you speak of it sounds incredible. Thanks so much for sharing! Trust me, this life goal will not disappoint! Also- hurray for Anastasia fans! sounds fabulous! and love the dress. it looks amazing on you! Haha, I love the "american old" versus "european old" so much! ^^ When we were in the sates a man told us about the oldest house in his state and how much tourists went there. It was build in 1899... and so is the farm at the end of my street here in Belgium. It's so funny sometimes. Anyway. The difference is even more exaggerated out here. My hometown wasn't founded until 1909! kristian love this outfit! 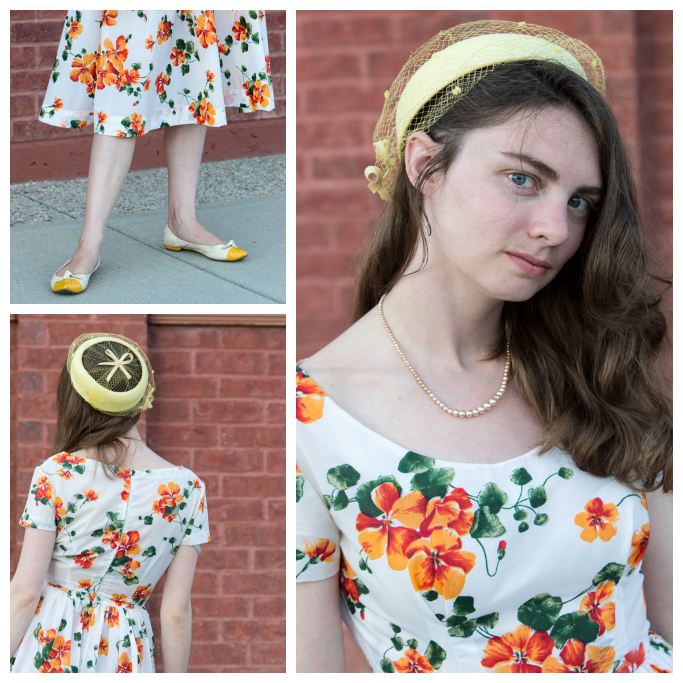 you look right out of the fifties! what a score that dress was. where all did you go in europe? planning a trip to italy for the fall. we loved your SF walking tour suggestion! Thanks Hattie! And so glad you liked the tour too! This year, for our honeymoon, we stayed pretty much in Paris. I have been to Italy before (with family and then as an English Language Teacher). I loved it! Especially Rome! Have fun and make sure to go to the Piazza Navona in the evenings (But don't eat at one of the restaurants there. They are expensive. Eating by the Parthonon or across the street the Campo Di Foiri is cheaper but still nearby and fun). Holy Moly Kristian, you look incredible! I can't imagine a better dress to wear on the streets of Paris, it looks pretty much perfect. What a sweetie of a new husband you have, too! Oh my word! You look so amazing! That dress is just so classy and wonderful! that is seriously the most beautiful dress ever you look beautiful my darling! This dress is perfect for you and perfect for Paris! This is the MOST BEAUTIFUL dress and you just glow in it! I adore the fabric and the spacing of the floral pattern is really perfect. Plus, I always prefer midi length skirts myself so this is just the best dress all around. I love how you styled it with the darling hat too. How sweet of your hubby to see how beautiful you'd look in this dress and buy it for you! Lucky it fits you like an absolute dream! Also, that flea market sounds AMAZING, I would have nearly drooled on everything I saw. Amos was very patience as I dithered whether to buy it or not, for sure (I love how it looks but the fabric is actually a bit plastic-feeling. VEry odd, almost like a shower curtain. Luckily one gets use to it pretty quick). Midi-length is my preference too. Kristian this dress is breath-taking!! You look beautiful! What a perfect outfit for dinner at the Eiffel Tower on you honeymoon! It sounds so incredibly romantic :) And this market sounds AH-MAZING. How sweet of your Hubby to buy you this beautiful dress! Oh my! The dress is divine - the shape, the pattern. I would not be able to stop twirling in it! Just thought I'd let you know I like this outfit so much I've chosen this as one of my Friday's top five! That's such a gorgeous dress, I love full skirts!